For this weeks post I'm going to show you my bag essentials. Now, I am one of those persons that loves to take everything in the bag and with everything, I mean literally everything. But I just want to show you the essential stuff and not all the rubbish things too. With that I always have to keep my headphones with me because life without music isn't life. Since I live in Switzerland where the weather is annoying a lot of times, I always keep an umbrella in my bag too. Up to my purse, it's a pink Victoria's Secret one and I love it so much! I got this brand new because as you know I had a Michael Kors one but it got stolen like a month ago. Fortunately my insurance got me the money back and with that I felt like buying this purse instead of another MK one, because I don't like them that much anymore. 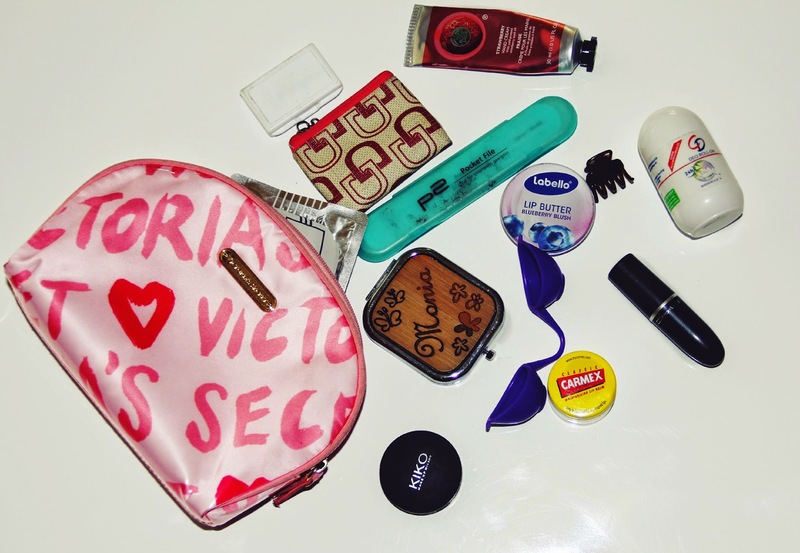 My last essential is this make-up bag from Victoria's Secret. I like to call this my "emergency kit" because I've basically everything I could ever need. - Deodorant....especially in summer this can be really useful. - Mirror. Who doesn't need a mirror? - Lip balm, in case your lips are chapped. - Nail file. You never know when your nail is going to break. - Hand cream. Always need one. - Another little bag with bobby pins in it. Never can have enough of them. - Solarium glasses. Me and my best friend want to go twice a week...even if we don't. To not forget the glasses I just have them in here. - Lipstick. Here I have a Mac one but I just replace it with the one that I'm using at the moment. - Kiko concealer. I don't take any other make up with me but concealer is always good. I have a lot of other stuff in there but I think you know now what I mean with "emergency kit"